Living a Fit and Full Life: Beat germs with PURELL's New HEALTHY SOAP! Now a healthier soap* from the brand you trust to help stop the spread of germs. Beat germs with PURELL's New HEALTHY SOAP! 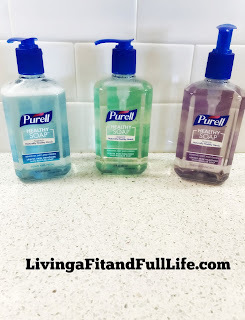 I absolutely love this hand soap from PURELL! My hands instantly feel hydrated when I use it and I love that it's not overly foamy. I also love that it supports the skin’s natural ability to protect against dirt and germs since our skin is usually our first defense against germs. PURELL's New HEALTHY SOAP comes in three scents which all smell amazing. I usually don't care for scented hand soaps but these actually smell good and aren't overwhelming like most. PURELL's New HEALTHY SOAP is a hit in my house and I highly recommend you guys all give it a try it! Click HERE to find a store near you that sells PURELL! Click HERE to learn more about PURELL! Follow PURELL on social media!